We’d love your help. Let us know what’s wrong with this preview of A River in Darkness by Masaji Ishikawa. Half-Korean, half-Japanese, Masaji Ishikawa has spent his whole life feeling like a man without a country. This feeling only deepened when his family moved from Japan to North Korea when Ishi An Amazon Charts Most Read and Most Sold book. To ask other readers questions about A River in Darkness, please sign up. Will the author of this book receive the royalties from the sales which he so greatly deserves? Who helped him to get his story written? Lo That's a good question. I also wondered if there might be negative consequences for him having this published, since the Japanese government seemed…moreThat's a good question. I also wondered if there might be negative consequences for him having this published, since the Japanese government seemed against him telling the story of his escape from China, and he still lives in Japan. So Amazon invited the author to submit the work, and the two translators are freelancers working for Amazon. It's a total mystery how they heard about the story... maybe it was originally published in Korean or Japanese, but I don't know either language and so can't really look. The author is presumably getting paid like any other Kindle direct self-publisher, thought probably not a ton of money. It's a fair question, though, whether the author is doing all this himself, or if someone is helping/exploiting him. I'm left with a strange feeling after reading this. According to his own story he has broken his agreement with the Japanese government by publishing this. This leads to one of three conclusions: 1) The author had permission to publish, but it was not disclosed in the book, 2) He published surreptitiously, or 3) This is a work of fiction. Which is it? This answer contains spoilers… (view spoiler)[ I have read quite a few of these types of stories, and with many similarities, I would bet money that it's true. The biggest difference with this book…more I have read quite a few of these types of stories, and with many similarities, I would bet money that it's true. The biggest difference with this book from the others is the escape to Japan instead of South Korea. Serfdom is freedom. Repression is liberation. A police state is a democratic republic. And we were “the masters of our own destiny.” And if we begged to differ, we were dead. This is one powerful little memoir. It's a true story that sounds like dystopian fiction - for most of us, it is difficult to imagine families being lured to a new "paradise", only to be met with famine, concentration camps and violence. It's hard to accept that this is still part of our world. I, like many, am fascinated and horrified by North Korea. Recent news stories have only fuelled that particular fire of fascination. I've read fiction about the history of Korea in books such as Pachinko, which showed many Koreans migrating to Japan during colonization and being seen as second class citizens. Then, later, when their home country was split in two, many were unable to return. I have also read Nothing to Envy: Ordinary Lives in North Korea, which documents a variety of different experiences from defectors. A River in Darkness complements both those books and adds something very unique - a detailed first person account of what it was and is really like to live in this secretive nation. Ishikawa was born in Japan but his Korean father was seduced by promises of "paradise" and having "everything you need" in North Korea. The Red Cross shipped Japanese families to North Korea; something which the Japanese government and the UN were all too aware of and made no effort to prevent. So Ishikawa's family packed up and got on the boat. They arrived in a wasteland of horrors and were given a shack to live in with no electricity or running water. For over thirty years, Ishikawa and his family suffered and starved. No one dared to speak out against the system, and it would have done no good if they did. As Japanese nationals, they were labelled as "hostiles", which meant they were given the worst jobs and worst homes. Ishikawa lost loved ones, his freedom, and most of his life to North Korea. It is a deeply sad memoir and even the ending brings little relief. Ishikawa admits that he can feel nothing but bitterness. It's a dark, haunting, and eye-opening look into one of the greatest atrocities of our time. The short version: This is easily the best firsthand narrative about life in North Korea that I've found, and it's a gripping, well-written story in its own right. If you haven't read anything like this, it will be VERY educational. But be aware that it doesn't have the happy ending the title implies, and prepare yourself accordingly. The long version: Some years ago, I realized that my view of North Korea was overly cartoonish. I didn't want to think of it as "the most hilarious awful dictators The short version: This is easily the best firsthand narrative about life in North Korea that I've found, and it's a gripping, well-written story in its own right. If you haven't read anything like this, it will be VERY educational. But be aware that it doesn't have the happy ending the title implies, and prepare yourself accordingly. The long version: Some years ago, I realized that my view of North Korea was overly cartoonish. I didn't want to think of it as "the most hilarious awful dictatorship" anymore, so I started reading about it. There's an awful lot of political and economic posturing and maneuvering to read about, and tons of analysis about the leaders and the military, but what about the actual people who live there? What are their lives like? Turns out that it's pretty hard to find out. The fact that regular citizens, especially the non-elite, are essentially hostages makes it hard to get information. I found and really enjoyed Nothing to Envy: Ordinary Lives in North Korea, a collection of stories from former North Koreans living in exile. That's interesting in that the stories come from a variety of people who came from different backgrounds in North Korea, but this book is a much more in-depth picture of a single life, and has better narrative flow. The prose is spare and impressively clear, and the book is quite short. Ishikawa was born in Japan and moved as part of a mass migration program that essentially tricked huge numbers of Koreans to "return" from Japan to North Korea, facilitated by the Red Cross. Many had never even been to North Korea, and empty promises of opportunity were repeated for years. This program, and the subsequent ill treatment of the Japanese "returnees" by the "native" Koreans was eye-opening to discover. Because of this aspect, the story manages to be even more grim than other stories I've read, which is really saying something. Just the first few pages, while he's still a child in Japan, were enough to fill an entire teary daytime talk show. And while life after escaping is never easy for the fortunate Koreans who make it out alive, the poor guy has a worse outcome than any I've heard before. The horrors in the lives depicted are many, from the extreme to the mundane - starvation, long propaganda meetings, being denied opportunity due to circumstances of your birth, facing inadequate shelter, and that's all before the 90s famine. But the greatest horror is revealed gradually across many small moments: to survive people must lose their humanity, stop seeing each other as people, no longer caring if their neighbors live or die. Then the government uses the citizens as the most effective tool to oppress themselves by turning them against each other, encouraging and rewarding reporting your own family for defying the regime. The most common lament I've read (across all accounts) about the famine was, "the kind people were the first to die." As much as I found myself deeply appreciating eating dinner after reading this, I was even more moved by the love and support of my friends and family, savoring the marvelous experience of not having to fear for their lives every day. I would recommend that everyone read this, and probably try to convince them given the opportunity, because there's a lot more to North Korea than nuclear weapons. If more people knew what life there is like, it would undoubtedly help -- it's pretty hard not to care in the face of this insanity. But I wouldn't force this on anyone, because it really is a difficult read twice over. First, while you're reading, the events in the story are brutal. It's hard to watch an incredibly resilient protagonist be defeated again and again. Then after you're done with the book, it's depressing to watch the world let this situation continue because it's too much trouble to address. The political and economic arguments seem even more unsatisfactory. On the other hand, it's not all bad. Nothing has ever made me appreciate my life like reading this. Every time Ishikawa's story pops into my mind, and it's hard to forget, I feel a huge wave of gratitude in addition to the sadness and compassion. 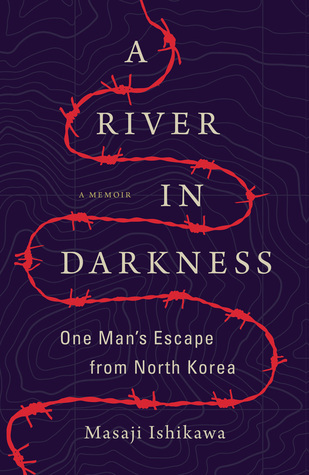 I liked A River in Darkness: One Man's Escape from North Korea a lot. It is a personally told story. The author is speaking from his heart of what he has experienced—first ostracism in Japan due to his dual Japanese and Korean background, then the horror of the thirty-six years of his life spent in North Korea from 1960-1996 under the rule of Kim Il Sung and then Kim Jong Il, why he had to flee, how he did it and finally what happened when he returned to Japan. 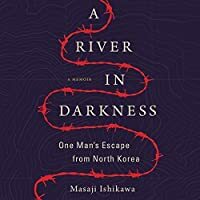 During his youth in Japan, where h I liked A River in Darkness: One Man's Escape from North Korea a lot. It is a personally told story. The author is speaking from his heart of what he has experienced—first ostracism in Japan due to his dual Japanese and Korean background, then the horror of the thirty-six years of his life spent in North Korea from 1960-1996 under the rule of Kim Il Sung and then Kim Jong Il, why he had to flee, how he did it and finally what happened when he returned to Japan. During his youth in Japan, where he was born in1947, he was discriminated against because of his Korean background. Emigrating to North Korea at the age of thirteen, he was again discriminated against, now because of his Japanese background. His mother was Japanese, his father South Korean. He has lived a very difficult life as a second-class citizen without a country to call home. Successfully escaping from North Korea in 1996, perhaps this looks like a story with a happy ending. It isn’t. This man’s life is noteworthy. His life story needed to be published. It is a memoir written not for him but for us. The book was first published in 2000, but only now has it drawn attention, twenty-two years after fleeing North Korea. The Japanese government helped Ishikawa escape, but his escape was hushed up and he was not to tell anyone. Relations between Japan and China would otherwise have been strained. Back in Japan, he was no longer on the verge of death from starvation, but he was a-g-a-i-n without job, family or friends. He escaped for the sole purpose of rescuing his family, and this he has not been able to do. The dire situation existing in North Korea is today common knowledge. The Korean leaders are faulted, as they should be, but the complicity of Japan, China, the UN, the Red Cross and other world authorities should be acknowledged too. The events in Ishikawa’s life show this. It took me awhile to get caught up in the story. I approached the book from the wrong direction. I was looking for an impersonal presentation of clear facts, and it took me a while to understand what this book offers instead. I questioned some of the information laid at my feet. I found holes in what I was given. I would ask myself why did that happen and why did that person do that?! For example, it is hard to understand why Ishikawa’s mother married his father. Neither are we given a full explanation of how and why his father ended up in Japan. This is not a book written by an impartial third party, nor a book offering a thorough presentation of documented facts and research. The author does not have full information; he is telling us what he does know, and he is telling it as if you were sitting across the table from him. He is just talking, not in fancy words, not peppered with proof or statistics. He speaks in simple words, telling how, step by step, his life unfolded, how one event lead to another and another and how it has felt to live through these events! He swears. Yes, he complains. He isn’t stoical, but I came to completely understand his anger, his disappointment and his frustration. This is an engaging personal story. We need stories such as this. We are not told how the author came to write this book nor what he is doing today. I listened to the audiobook narrated by Brian Nishii. I have given the narration four stars. It felt as though the author was speaking to me directly. It felt as though there was nobody in between me and the author. I felt his exhaustion, his anger, his fear and his frustration. There is a need for both non-fiction books that are well researched, without bias and provide an all-inclusive presentation of facts as well as those that have a more personal angle. It is the latter that we have here. This book shows us how it is to live through the events we hear of on the news. There, we are distanced from the facts. Here, events are brought up close, so we understand them on an emotional level. Each gives a different perspective. A devastating account of one man's life in North Korea. This also has the added element of examining North Korean life from the perspective of someone who is half-Japanese, half-Korean. A good companion piece of Pachinko and In Order to Live. It's been a while since I read anything in one sitting, but this was utterly heartbreaking and compelling. Masaji Ishikawa and his family moved to North Korea during the great migration of Japanese/Korean immigrants to the communist state in the 1960s. Promises of a paradise and jobs for all duped many a family at the time, but the reality was far from what was expected. This is by far one of the best first hand accounts I've read of life in North Korea, and in some respects it completely overwh It's been a while since I read anything in one sitting, but this was utterly heartbreaking and compelling. This is by far one of the best first hand accounts I've read of life in North Korea, and in some respects it completely overwhelmed me. The outpouring of grief, bitter regret and disappointment Masaji feels for himself and his family is palpable on every page. It's his passion to tell his story, and shame both the Korean and Japanese governments for their failings, that make this so readable - but never enjoyable. It follows Masaji from that fateful journey across the sea to North Korea, to his life as a tractor driver and endless search for a happy life with his growing family, to the famine of the late 1980s and early 90s which ultimately leads to his desperate escape. This was a disturbing true story about conditions in North Korea, so much so that I find that I don’t wish to go back and listen to parts of it again in order to make a better review. If only the world was not so full of suffering. If only people were not beaten, killed, starved or worked to death, what a better place this would be. But what happened in North Korea, and could still be happening for all I know happens in many countries, and it makes me wish that the U.N. could step in and correct This was a disturbing true story about conditions in North Korea, so much so that I find that I don’t wish to go back and listen to parts of it again in order to make a better review. If only the world was not so full of suffering. If only people were not beaten, killed, starved or worked to death, what a better place this would be. But what happened in North Korea, and could still be happening for all I know happens in many countries, and it makes me wish that the U.N. could step in and correct things all over the world. It is not to be. But then I read that humanitarian wars cause much more suffering. This was a story about a man and his family that had lived in Japan as displaced people and were then sent back to North Korea from their new home in Japan. North Korea was said to be the land of milk and honey, a paradise. It was nothing but. It was hell. Masaji tried to take care of his family, but the pay was not enough to feed them. This is beginning to feel like the poor class in America who can’t afford to eat or pay for their medical expenses, but, yes, I realize that it was much worse there. People were beaten, sent to concentration camps, murdered, and literally died in the streets. Part of that reminds me of how the black and brown people are sent to prison to rot for much less crimes than the white people in this nation. Anyway, by the time that Masaji crossed the river into china, he was skin and bones, and he had lost family members. "Her desperation, her fear, her exhaustion-all of it seeped through her thin clothes and straight into my heart." This is not the first non fiction book that I have read, regarding real people's lives in North Korea. It probably won't be my last, either. Much of the information in this particular account wasn't new to me, but this did not stop the utter disbelief washing over me, as I was reading. This very personal memoir is just gut-wrenchingly tragic, and it is told with such honestly, that the "Her desperation, her fear, her exhaustion-all of it seeped through her thin clothes and straight into my heart." This very personal memoir is just gut-wrenchingly tragic, and it is told with such honestly, that the horrors Masaji Ishikawa endured over all of those years, is all the more vivid and harrowing for the reader to digest. This memoir gives a powerful insight to what life was actually like in North Korea. I think countries know enough about this and should do more rather than simply turning a blind eye to it, in order to protect themselves. While the life that Mr. Ishikawa live was horrifying by anyone standards, I found that at time the book was difficult to read. At moments it seemed as though a cohesive thought was not entirely transformed from reality to word. I think that has a lot to do with the fact that this book was written from translation, so I can’t really fault it. I’m not a history buff, I will never claim to be. I know enough that I was able to graduate from school but never really gave much thought to what was being While the life that Mr. Ishikawa live was horrifying by anyone standards, I found that at time the book was difficult to read. At moments it seemed as though a cohesive thought was not entirely transformed from reality to word. I think that has a lot to do with the fact that this book was written from translation, so I can’t really fault it. I’m not a history buff, I will never claim to be. I know enough that I was able to graduate from school but never really gave much thought to what was being taught to me. I find the memoirs have become a much more effective way for me to comprehend the history throughout the world as opposed to reading from a textbook that seemed to just ramble facts off. For instance I’m sure I learn of what was happening in Korea prior to reading A River in the Dark. But as I read I became more invested in the journey, more invested in the political aspect, the trying nature of the events that unfolded. I was left elated and heartbroken as I reached the end of one man’s journey to just return home to a life that was striped from him because he was a child. The worst part is that even though this is part of our global existence not enough is being done to rectify the situation for him and everyone who has and still are suffering. One can only hope that something even if it small can be accomplished with that talks between South and North Korea. Yes, after reading this memoir I found myself wanting to know what was happening. This was the first time in a long time that I voluntarily looked up anything along the political line. Now with all the positive being said I still had one question left unanswered. Once you draw to the conclusion of the story Masaji Ishikawa openly tells that he is not suppose reveal that the Japanese authority helped in him in anyway. But by writing this novel is that not what he did. Did he not reveal the one part of the agreement that was the most crucial. There are also other questions that sort of had been left open. While some information was given to the whereabouts of his family that was left in Korea, there really wasn’t a complete conclusion. A breathtaking real, unfiltered view of life in North Korea as a Japanese-Korean. Not all tales end happily, but Masaji Ishikawa's story exemplifies the resilience of the human spirit and importance of optimism even in the darkest of times. Beyond comprehension. The atrocities are being silenced but must be made known. No one should endure what these people do. I feel like I've been on a non-fiction kick lately and I've loved every minute of it. What first got my attention was the cover. I don't really know how else to explain it other than say it intrigued me so much that I didn't even think twice before I clicked it. Second, the title makes you think it will be a happy-ish book. Or that it will have a happy ending after all of the doom, sadness, and torture thrown upon you. Don't get your hopes up high people because this is one spoiler you will get fr I feel like I've been on a non-fiction kick lately and I've loved every minute of it. Second, the title makes you think it will be a happy-ish book. Or that it will have a happy ending after all of the doom, sadness, and torture thrown upon you. Don't get your hopes up high people because this is one spoiler you will get from me: there is no happy ending. Nope, not here. If you want one.. look somewhere else. 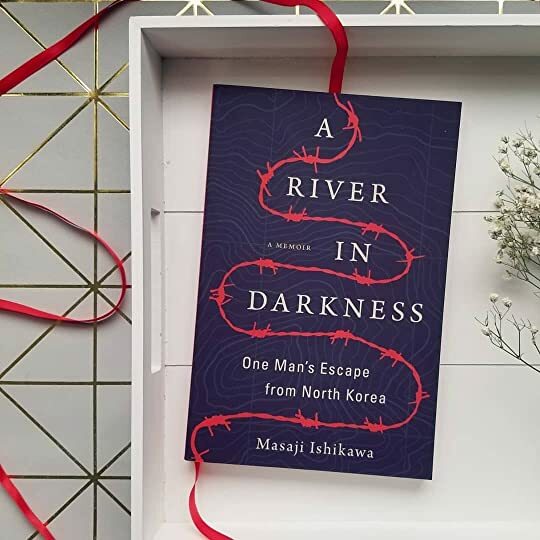 A River in Darkness: One Man's Escape from North Korea was such an amazing book. It definitely tug at my heart strings and I'm pretty sure there were some tears falling down my cheeks as well. Since I already mentioned one spoiler about this entire book I'm going to try really hard not to spoil anything else. Masaji, the MC, takes you on this heart wrenching journey of him battling through North Korea. Fair warning, you will cry at some point in this book. He goes through starvation and trying to fight to keep food on the table for his family. He went through discrimination for being half-Japanese. This resulted in him getting beaten up, shot, or turned away from everyone on a daily basis. I probably cried the whole book - or shed tears throughout some chapters. Okay, all of the chapters. OKAY, THE ENTIRE BOOK. Seriously, I don't think I've ever cried so much from one book. I loved everything about this book and the story that was told. It definitely helped me see a more definite side of North Korea. I felt for Masaji and his family so much. I wish this book had a happy ending. Truly I do. I'm so glad that I got to read this book and that it was available on Kindle for free. I'm moved. I'm touched. I have no idea how I'm going to fall asleep right now after that book. My first love in books is horror followed closely by psychological thrillers. When I read nonfiction/memoirs, I typically stay somewhat within the same genre - true crime, etc. As a half South Korean woman, I also typically avoid reading anything regarding North Korea. I always assumed that these types of books would be the only ones that would get me "triggered"... and by that I mean PISSED OFF! However, when Ashley at Amazon Publishing gave me this book, I couldn't NOT read it.. and I'm SO hap My first love in books is horror followed closely by psychological thrillers. When I read nonfiction/memoirs, I typically stay somewhat within the same genre - true crime, etc. As a half South Korean woman, I also typically avoid reading anything regarding North Korea. I always assumed that these types of books would be the only ones that would get me "triggered"... and by that I mean PISSED OFF! However, when Ashley at Amazon Publishing gave me this book, I couldn't NOT read it.. and I'm SO happy she sold me on this. Turns out, it may as well be a horror book... unfortunately. Phew - I'm still trying to wrap my feelings around this one. Masaji takes us on his journey. That's thirty-six (36) years of him living in North Korea with his family. Decades of trying not to starve to death. Decades of trying not to get shot, beaten up or turned away simply for being 1/2 Japanese - something that is (obviously) out of his control. Decades of wondering how the government did NOTHING that it promised them. Becoming walking skeletons and deciding that dying trying to escape was better than the alternative - because clearly dying was going to happen anyways. Watching family members, children and seniors alike, dying all around you. Uff. At 178 pages, Masaji manages to put you right in there with him. At one point he even apologies to the reader .. but then saying it was necessary to say to show exactly how bad they had it. "So there we were—the beneficiaries of smug humanitarianism—prisoners in paradise on earth." After reading this book, my first inclination is: What right do I have to judge Masaji Ishikawa's life story? Not much as far as I can see, my opinion is irrelevant. "I soon learned that thought was not free in North Korea. A free thought could get you killed if it slipped out." This is a raw, honest story of extreme suffering told in a unique voice—I'm not sure if it was the translation or syntax, but the tone was almost childlike in its simplicity and straightforwardness. "You don't choose to be born. You just are. And your birth is your destiny, some say. I say the hell with that. And I should know. I was born not just once but five times. And five times I learned the same lesson. Sometimes in life, you have to grab your so-called destiny by the throat and wring its neck." There were a couple points where the timeline seemed to contradict itself, and got a little muddled, but the big picture is clear: North Korea is one of the worst places in the world to live. "This was laughable, of course, but that's always the way with totalitarian regimes. Language gets turned on its head. Serfdom is freedom. Repression is liberation. A police state is a democratic republic. And we were 'the masters of our destiny.' And if we begged to differ, we were dead." I started this book on a Sunday afternoon as it happened to be on my Kindle. Several times I tried to put it down to finish later, but I couldn't stay away. Finally, I finished reading it in bed at 2am—all in one "sitting." A quick engrossing read, this book is heavy. I can't give such a collection of traumatic events five stars, it feels wrong. * Still, this account is important and something we need to be aware of to ensure it never happens in our country. "And I came to recognize that, no matter how difficult the reality, you mustn't let yourself be beaten. You must have a strong will. You have to summon what you know is right from your innermost depths and follow it." A RIVER OF DARKNESS by Masaji Ishikawa (translated by Risa Kobayashi and Martin Brown) Thank you so much to Amazon Publishing for sending me a free copy - all opinions are my own. This story is so personal—you feel as if your friend is telling you a story. It’s not over A RIVER OF DARKNESS by Masaji Ishikawa (translated by Risa Kobayashi and Martin Brown) Thank you so much to Amazon Publishing for sending me a free copy - all opinions are my own. This story is so personal—you feel as if your friend is telling you a story. It’s not overly dramatic—it doesn’t need to be. The details of this little book are very upsetting and hit straight to the heart. Masaji Ishikawa tells his life from his childhood in Japan, up through his escape from North Korea. He was born in 1947, just after the conclusion of the Second World War, and after Japanese colonial rule in Korea ended. His father, Do Sam-dal, was Korean and his mother, Miyoko Ishikawa, Japanese. It was a tumultuous childhood, full of fear, anger, and pain. Even though his mother’s family was respected, his father was not. His father was very resentful towards his mother and took it out on her. When Masaji was thirteen, his father insisted they move to North Korea under the regime of Kim Il-Sung. He thought he’d have a better life in North Korea, which he had told would be “paradise on Earth”. Except, as Masaji describes it, it was hell on Earth, and after reading his story, I am in 100 percent agreement. His childhood was difficult but it did not hold a handle to the struggles of living in North Korea for thirty-six years and every time I saw the phrase, “Luckily I...” I couldn’t believe how optimistic he was—the human spirit is an amazing thing. I also thought it was interesting to see the change in his father’s temperament over the years in North Korea. And how Masaji finally understood what made his father who he was. I loved how matter-of-factly Masaji speaks. It is very well-written memoir and I believe 170 pages is all it needed to be extremely impactful. This is an important story and one that everyone should know and understand. Memoir of Masaji Ishikawa wherein he relates the details of his life from being born in Japan in 1947 to moving with his family to North Korea, where they were promised “paradise on earth,” to his escape to Japan in 1996. Unsurprisingly, the so-called paradise never materialized, and his family’s standard of living gradually diminished until it reached starvation-level. Ishikawa tells his story in a very straight-forward conversational manner. This memoir delivered educational information about l Memoir of Masaji Ishikawa wherein he relates the details of his life from being born in Japan in 1947 to moving with his family to North Korea, where they were promised “paradise on earth,” to his escape to Japan in 1996. Unsurprisingly, the so-called paradise never materialized, and his family’s standard of living gradually diminished until it reached starvation-level. Ishikawa tells his story in a very straight-forward conversational manner. This memoir delivered educational information about life in North Korea under Kim Il-sung. It is often a gut-wrenchingly difficult read, as he and his family dealt with such an array of appalling circumstances, such as racism, brutality, discrimination, threats, policies that made no sense but were mandated to be followed, brainwashing of the masses by the government, and death of family members. Short but powerful. Recommended to those interested in Korean history, especially first-hand accounts of life in North Korea. This is a short book, but what a harrowing, thought-provoking story it tells! It is not an easy read, this man's account of life in North Korea, his escape back to Japan and the terrible losses he and his family suffered in the process. I kept feeling stunned when the author mentioned the dates - so recent! - and that people dying of starvation seems a fairly common occurrence in North Korea. he paints a bleak picture, made bearable by the fact that he felt close bonds with his family. An eye-op This is a short book, but what a harrowing, thought-provoking story it tells! It is not an easy read, this man's account of life in North Korea, his escape back to Japan and the terrible losses he and his family suffered in the process. I kept feeling stunned when the author mentioned the dates - so recent! - and that people dying of starvation seems a fairly common occurrence in North Korea. he paints a bleak picture, made bearable by the fact that he felt close bonds with his family. An eye-opening and important book! I honestly think this book is the modern day Night. It's just as harrowing a story and is something that needs to be talked about and pushed into the public eye more. I'm sat here worried about Brexit but at the end of the day, I'm going to have my family, food and a place to live - millions of people living in North Korea have none of these things. I know you can't always compare your situation to situations such as this but it puts things into perspective and makes you realise just how easy yo I honestly think this book is the modern day Night. It's just as harrowing a story and is something that needs to be talked about and pushed into the public eye more. I'm sat here worried about Brexit but at the end of the day, I'm going to have my family, food and a place to live - millions of people living in North Korea have none of these things. I know you can't always compare your situation to situations such as this but it puts things into perspective and makes you realise just how easy you have it. There are a few reviews of this that talk about how the book is all pain and misery, which is certainly true, but they talk about that in a negative way. I'm not sure what those people were expecting to read when they picked up this novel about an escapee of North Korea? Admittedly there isn't a whole lot of resolution to the end of this book but I don't think one man's story of death and starvation could be anything other than pain and misery. I personally think this book was a courageous move on Ishikawa's part and informs a new generation of the horrors of North Korea. Pirmoji mano perskaityta knyga apie Šiaurės Korėją buvo Adam Johnson "Našlaičių prižiūrėtojo sūnus". Šis romanas iki dabar man yra vienas geriausių kada skaitytų. Jis ir sukrėtė, ir sujaudino, ir ilgam įstrigo. Perskaičiusi norėjau dar daugiau sužinoti apie tą šalį, iš kurios nori sprukti kiekviena gyva būtybė. Na, ne kiekviena. Tai šalis, kurioje gera gyventi tik vienam žmogui. Skamba kraupiai, be tokia šiandienos realybė. Taigi, ėmiau ir perskaičiau knygas, kurias pavyko rasti šia tema: "Pabėg Pirmoji mano perskaityta knyga apie Šiaurės Korėją buvo Adam Johnson "Našlaičių prižiūrėtojo sūnus". Šis romanas iki dabar man yra vienas geriausių kada skaitytų. Jis ir sukrėtė, ir sujaudino, ir ilgam įstrigo. Perskaičiusi norėjau dar daugiau sužinoti apie tą šalį, iš kurios nori sprukti kiekviena gyva būtybė. Na, ne kiekviena. Tai šalis, kurioje gera gyventi tik vienam žmogui. Skamba kraupiai, be tokia šiandienos realybė. Taigi, ėmiau ir perskaičiau knygas, kurias pavyko rasti šia tema: "Pabėgimas iš lagerio Nr. 14", "Neturime ko pavydėti". Tik dvi... Ir abi jos itin šokiruojančios, graudinančios, pykdančios dėl tokios neteisybės. Tai knygos, kurių niekad nerekomenduočiau jautriam žmogui. Pati tokia esu, ir perskaičiusi jas ilgai sau neradau vietos. "Upė tamsoje" - dra viena tikra istorija apie Šiaurės Korėja. Dar vienas skaudus, prarastų gyvenimų liudijimas. Masadžio tėvas buvo korėjietis, o mama japonė. 1958 metais, kuomet Masadžiui buvo trylika metų, visa šeima patikėjo Šiaurės Korėjos pažadais ir išvyko ten gyventi. Šalis žadėjo geriausius darbus, geriausias sąlygas grįžusiems korėjiečiams, tačiau vos ten atvykę, žmonės suprato papuolę į spąstus. Šalyje nebuvo jokio darbo, jokios laisvės ir jokio maisto. Gyvavo žiaurios represijos, bausmės, badas ir nepriteklius. Visa šalis buvo valdoma baimės, prievartos ir skausmo. Masadžis pasakoja kaip už kelis ant žemės numestus ryžių grūdelius jį kone negyvai sumušė, už ištiestą nugarą laukuose laukdavo lazdos kirčiai.. Šalis mirė badu. Praeiti pro išdžiūvusius lavonus nebebuvo iššūkis, nestebindavo žinios, jog daug kur vyrauja kanibalizmas. Masadžis ryžosi sunkiausim savo žingsniui gyvenime - pabėgti į Japoniją. Jis paliko net savo šeimą - žinojo, kad iš ten jiems galės padėti daugiau. Jis bėgo nebijodamas gauti kulkos į nugarą. Vistiek geriau mirti, nei likti čia. I've long been interested in North Korea - writing my undergraduate dissertation on female North Korean refugees and their treatment in China - so I always try to check out any new memoirs or non-fiction books on the country. I've previously read Nothing to Envy: Ordinary Lives in North Korea, This is Paradise!, Somewhere Inside: One Sister's Captivity in North Korea and the Other's Fight to Bring Her Home and parts of Under the Loving Care of the Fatherly Leader: North Korea and the Kim Dynasty I've long been interested in North Korea - writing my undergraduate dissertation on female North Korean refugees and their treatment in China - so I always try to check out any new memoirs or non-fiction books on the country. I've previously read Nothing to Envy: Ordinary Lives in North Korea, This is Paradise!, Somewhere Inside: One Sister's Captivity in North Korea and the Other's Fight to Bring Her Home and parts of Under the Loving Care of the Fatherly Leader: North Korea and the Kim Dynasty, and found them all to be fascinating in a kind of horrible but informative way. So I was interested to see if Ishikawa's memoir would be at all similar or shed new light on the country and life there. At least some of the accounts of life in North Korea that I've read previously have if not happy endings, at least slightly positive and hopeful conclusions. I think this is what people have come to expect from such memoirs, that surely anything would be better than life in North Korea. Yet Masaji Ishikawa's harrowing account does not have such a redemptive conclusion. It is not a spoiler that he escapes to China - and eventually returns to his home country, Japan - however the way the book ends was incredibly shocking to me. I think this book is 100% worth reading for his honesty and the fact that it sheds new light on the plight of North Korean refugees and life after escaping the country. Tragic. That one word sums up this entire memoir. I've read both Fiction and Non-Fiction books about North Korea which has provided me a pretty good background about what life is like there. What I didn't know until reading this memoir is nearly 80,000 Japanese moved to North Korea after WWII. They were told North Korea was a land of paradise. The author was born in Japan and moved to North Korea in 1960 when he was 13 years old. He lived there for 36 years. It is truly astounding that so many mo Tragic. That one word sums up this entire memoir. I've read both Fiction and Non-Fiction books about North Korea which has provided me a pretty good background about what life is like there. What I didn't know until reading this memoir is nearly 80,000 Japanese moved to North Korea after WWII. They were told North Korea was a land of paradise. The author was born in Japan and moved to North Korea in 1960 when he was 13 years old. He lived there for 36 years. It is truly astounding that so many moved their families to North Korea. The details the author shared about his life in North Korea was heart breaking. I've read about the famine of the mid 90s, however the author shared details I had not previously heard. This memoir was incredibly interesting and I highly recommend it for anyone wanting a better understanding of what life is like in North Korea. The memoir is available as a Kindle First offer to Amazon Prime members in December 2017. The book releases in January. I you think you have it tough go and read this book. The author is born in Japan to a Korean father and Japanese mother. In the early 60s his family happily accept the propaganda that life back in North Korea was a paradise. On their return reality was a life of poverty, corruption, ostracism, starvation, homelessness, unemployment and despair. After 38 years, the author escapes to China to find a country that will return escapees. Luckily some local Japanese government officials help him get ba I you think you have it tough go and read this book. The author is born in Japan to a Korean father and Japanese mother. In the early 60s his family happily accept the propaganda that life back in North Korea was a paradise. On their return reality was a life of poverty, corruption, ostracism, starvation, homelessness, unemployment and despair. After 38 years, the author escapes to China to find a country that will return escapees. Luckily some local Japanese government officials help him get back to Japan where he is again an outsider, unable to find work and with no contact with his family back in Korea. Trigger warnings: domestic violence, violence, death of a parent, death of a child, starvation, brainwashing. Wow. Like...woooooooow. I bought this book on a whim when it was a Kindle deal of the day earlier this year. And then I promptly put off reading it up until now. And I'm sorry I put it off for so long because this book was astonishing. There've been quite a lot of biographies published recently about North Koreans escaping through China. This one was actually published back in 2000 in Jap Trigger warnings: domestic violence, violence, death of a parent, death of a child, starvation, brainwashing. There've been quite a lot of biographies published recently about North Koreans escaping through China. This one was actually published back in 2000 in Japanese and has only fairly recently been translated to English. The author is now in his 70s, so while this is short, it's definitely a more complete picture of life in North Korea than, say, In Order to Live or Every Falling Star, purely because Ishikawa a) experienced life in North Korea from the early 1960s onwards, b) spent most of his adult life in North Korea, and c) had to support a family in North Korea. A mortifying account of a man's escape from North Korea - that will leave you hollow inside. How little does man actually need, and how often even that is deprived. I saw 'North Korea' on this memoir and had to read it. I don't think I even fully got through the synopsis and new I was going to read it in one sitting. There is a huge curiosity when thinking about the average person living in North Korea. What this man and his family went through was unbelievable. It's a real life horror story and if it doesnt give you the 'feels,' I dont know what will. I'm giving this 5 stars because I am absolutely not qualified to review or rate this book. A true glimpse I saw 'North Korea' on this memoir and had to read it. I don't think I even fully got through the synopsis and new I was going to read it in one sitting. There is a huge curiosity when thinking about the average person living in North Korea. What this man and his family went through was unbelievable. It's a real life horror story and if it doesnt give you the 'feels,' I dont know what will.